You can now use Burger King gift cards to get Credits on World Golf Tour. Choose Credit Amount and select "Gift Cards"
Use your WGT Credits to upgrade your virtual golf equipment in the Pro Shop, enter virtual tournaments, or play match play or skins challenge games against other players. 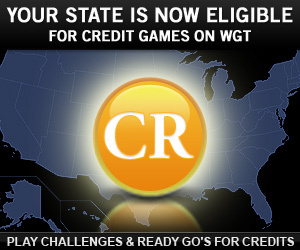 WGT players in a number of countries and USA states are now eligible to play games for WGT Credits, including Ready Go tournaments and Challenge multi-player games. Ready Go golf tournaments are fast stroke play competitions, limited to just 50 players with the top 30 players earning WGT Credit prizes. 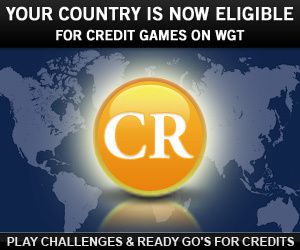 There’s always a Ready Go available, and WGT Credits are typically awarded within a day of all 50 players posting their score. You can also now compete for Credits in Challenge games, where you play against other WGT players to win WGT Credits, including matchplay, skins or blitz challenge games. Use all your WGT Credit winnings to upgrade your virtual golf equipment in the Pro Shop and improve your game. 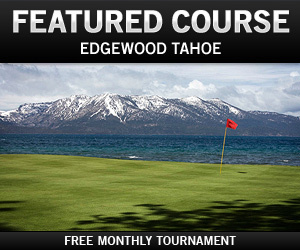 Play this month's featured course in the Edgewood Challenge tournament on World Golf Tour. This free closest-to-the-hole tournament is a fun 9-hole challenge with beautiful lake views on the scenic Edgewood Tahoe golf course, host of the American Century Celebrity Pro-Am every summer. The beautiful course is located on the South Shore of Lake Tahoe, walking distance to casinos and minutes from Heavenly and world-class ski resorts. There's a new featured WGT course every month, so check back for new challenges! If you're not already playing WGT, sign up free here. 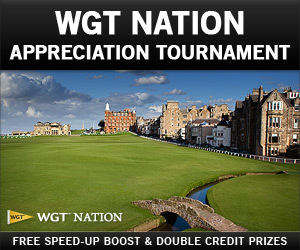 To thank our NATION members this month, we're hosting the WGT NATION Appreciation Tournament and giving a free Speed-Up Boost to every member that enters. Use Speed-Up Boosts to play WGT faster, so you can play twice as much, especially in multi-player games. The boosts don't affect your game performance in any way, they just make your shots display twice as fast. You can turn Speed-Up Boosts on/off in the Game Menu whenever you'd like. This special online golf tournament is tiered, so the top 70 players in each tier will also split a double WGT Credit purse prize. It's free to enter and runs now thru 1/31/13, so don't miss out on the unlimited stroke play action. *Special offer available to WGT NATION members who enter the tournament, get 1 free Speed-Up Boost (2x). Tournament runs now thru 1/31/13, see tournament page for details and eligibility. 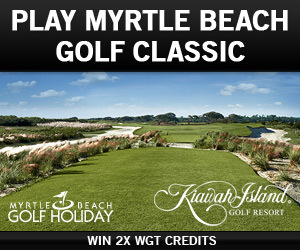 WGT partner, Myrtle Beach Golf Holiday is hosting a special tournament for USA and Canada players, with the top 70 scores winning double WGT Credits. This unlimited, 18-hole stroke play virtual golf tournament on Kiawah runs now thru 2/10/13. And don't miss your chance to win a dream golf trip to Myrtle Beach by entering the "Monday After The Masters" Celebrity Pro-Am contest, sponsored by Myrtle Beach Golf Holiday. No purchase necessary to enter or win, see rules for more information. You can play the new Nike VR_S Covert Driver first on World Golf Tour, before Nike releases the real driver to the rest of the world. The first thing you'll notice about the Nike Covert Driver is the striking red clubhead, which is sure to make a statement on any virtual tee. And while the Nike Covert Driver definitely provides more distance (especially carry distance) and good overall performance, the really exciting part about this new virtual driver is the Nike FlexLoft option. WGT players typically equip just 1 driver for each round, based on the course and wind conditions, but you can also choose to carry more than one driver in your bag (in virtual or real golf). You just have to decide what other club you'll remove, for example some players choose to play with 2 drivers and only 1 three-wood or hybrid. It's all part of the game. The virtual Nike Covert Driver unlocks for top players on World Golf Tour at Level 50 and Level 75, and is sure to become one of the most popular drivers in the game. Golfers may also be interested in the real-world Nike Covert Driver. Last month, a few of us had a chance to hit the real driver, and it's pretty awesome. In fact, the new sound on WGT when you hit the virtual driver is the actual sound from us hitting the real driver, at the Presidio Golf Club driving range in San Francisco. 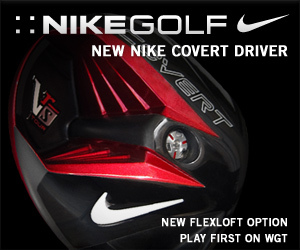 You can learn more about the real-world Nike Covert Driver and pre-order it from Nike Golf here. 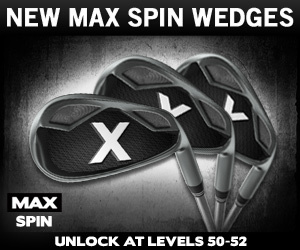 We've just added new MAX Spin Wedges to the Pro Shop, featuring the maximum amount of backspin available on World Golf Tour. Use the additional spin on your approach shots to back-up the ball like a pro. 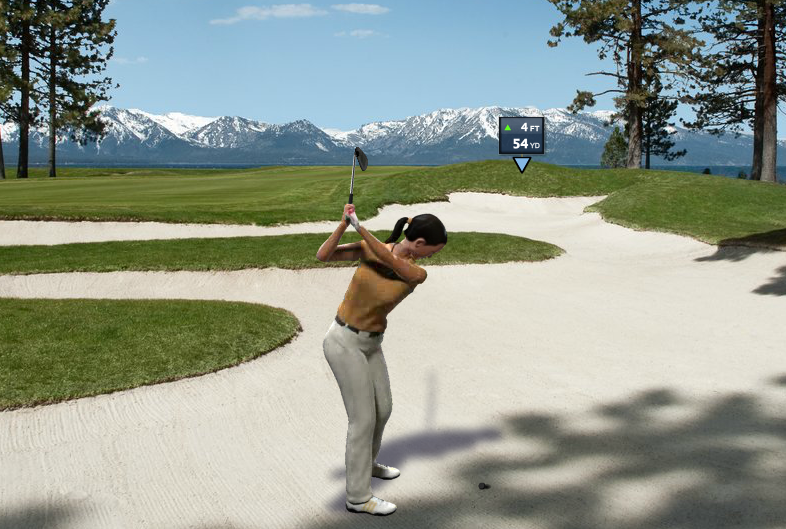 These virtual clubs start to unlock at Level 50 and are available in 56, 60 and 64 degree options. See all the MAX virtual equipment in the WGT Pro Shop. 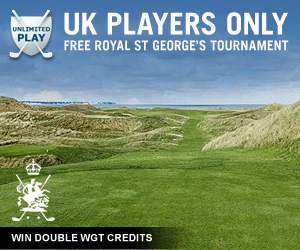 UK players, compete in a free UK-Only tournament this month on World Golf Tour. This unlimited, stroke play golf tournament is open to our UK players only, with the top 70 players splitting a double WGT Credit purse. The special tournament is hosted on Royal St George's, site of the 2011 Open Championship, and runs now thru 1/31/13. Play "The Challenge at Manele" on Lanai, the newest closest-to-the-hole golf course on WGT. We've brought the beauty of Hawaii right to your computer with our newest closest-to-the-hole course. The Challenge at Manele was designed by Jack Nicklaus and has stunning views of the Pacific Ocean. This free 9-shot closest-to-the-hole game was photographed and produced entirely by WGT, providing high quality and realism. Be sure to enjoy the new course this weekend during The Sony Open, the first full-field event of the PGA Tour, held on neighboring Oahu. 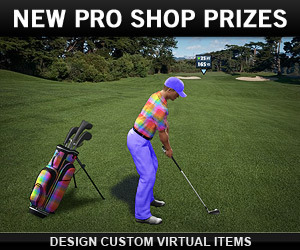 We've just added some new features to the World Golf Tour online golf game, including a new golf course, new MAX virtual golf clubs, and new prizes in the WGT Pro Shop. You can now play The Challenge at Manele, designed by Jack Nicklaus and located on the beautiful island of Lanai in Hawaii, the latest closest-to-the-hole golf course, free on World Golf Tour. This new Hawaii course is just in time for the first full PGA Tour event of the year, The Sony Open at Waialae Country Club. See tee times just posted on PGA Tour website. Get maximum backspin on your approach shots with the new MAX SPIN Wedges. Back up the ball like the pros! We're expanding the WGT Elite Collection in the WGT Pro Shop to give more players more items they can buy with their WGT Credits. You can now choose from new virtual prizes like a custom-designed avatar or golf bag, or get real-world golf tee times on more WGT courses, or even spend an hour on the phone with WGT co-founder, MisterWGT. 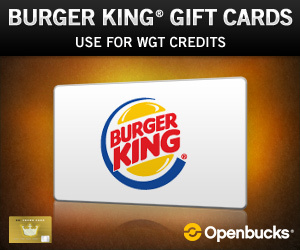 You can now use Burger King gift cards to get WGT Credits, like many players have been doing with Subway gift cards, so start putting all those holiday gift cards to some really good use on WGT! 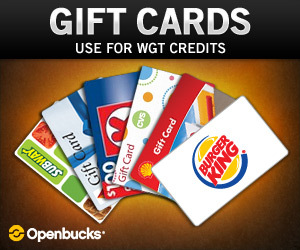 To use a gift card, simply go to the Buy Credits page on WGT, select "Change Billing Info" then "Gift Cards" to choose from any of the options, including Burger King, Circle K, Citgo, CVS and Subway.